Researchers from the National Cheng Kung University Hospital in Taiwan recently published a study on the impact of congenital hypothyroidism on risk of obesity. The study was published in the journal Pediatric Neonatology. Past medical records of infants with congenital hypothyroidism were reviewed. Participants were pulled from the records based on continued treatment beyond the age of three. Ninety participants were included in the final study. BMI at age six to seven were compared with the general population to determine obesity. Both male and female patients were included in the study. Adiposity rebound in girls tended to occur earlier than with boys. Earlier rebound was associated with increased risk of obesity, but only in the female population. Researchers also noted a connection between lower T4 levels post-treatment and obesity. Congenital hypothyroidism in children may be associated with increased risk of obesity. Clinicians should be aware of the connection and counsel parents and children on healthy eating and exercise to reduce the risk of obesity. Source: Chen SY, Lin SJ, Lin SH, Chou YY. 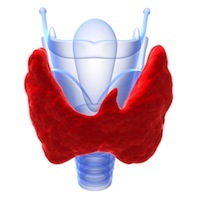 Early adiposity rebound and obesity in children with congenital hypothyroidism. Pediatr Neonatol. 2013 Apr;54(2):107-12. doi: 10.1016/j.pedneo.2012.10.008. Epub 2012 Dec 7.